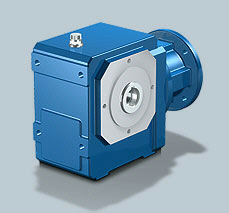 Right-angle gear unit of particularly compact dimensions and torsionally rigid block design. Cost-effective solution for rated torques up to 800 Nm. With solid shaft or alternatively hollow shaft with spiral groove. Purchase your Stober MGS S Helical Worm Gear Unit today!